Was born on Tuesday May 7th 2011 at 12:08 pm. She was 8 lbs 8 oz and 21 inches. She is healthy and strong. 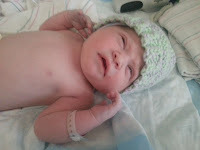 Calli is recovering nicely, and she did a wonderful job bringing little Haddie into this world. Now I have to go get myself a gun, because I'll need the next decade to practice my aim.